I’ve detailed out six of my primary eight characters in Star Wars: The Old Republic, and the seventh, as a part of the blog logo, has a blurb on a page dedicated to those characters. So it’s time, at last, to detail the final member of this bunch in the Cast List: Lasken, the Jedi Consular and Sage. And his story is an interesting one. Lasken was pretty much the last of the eight that I pushed through the class stories; the Consular didn’t really “grab” me as a concept. That said, I had an idea that I wanted to mess with that I thought could make him a bit more interesting to me. I’d had a Sith character who leaned more Light Side than Dark Side of the Force; so I thought it would be interesting to go the other way with Lasken-have him decide at some point in the Consular storyline to shift to the Dark Side. In short, to play out the Fall of a Jedi. All I needed was an inciting incident-maybe something like what happened to the planet Uphrades in the Jedi Knight story. Unfortunately, nothing really seemed to jump out at me during the Consular storyline. I kept going, and going, and going, and kept building up that stock of Light Side points. In the end, I found I had maxed out my Light Side numbers. I felt sort of stupid. 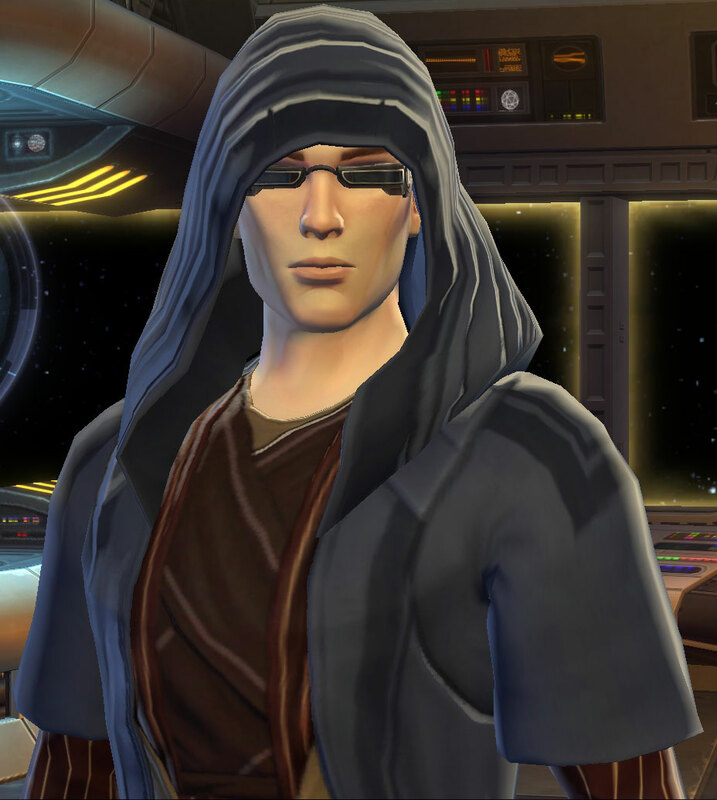 I’d even picked up a dark robes outfit for the character that I thought worked great (although I’m continually irritated by the clipping of the hood into the head-but I did find a solution to that…). Clearly, I needed to take less passive steps. So I decided to use the character’s status as a springboard for a classic fatal flaw: hubris. Overwhelming pride. Arrogance. As I ran him through Makeb, I started having him take the impatient path, irritation with his allies, and contempt for his enemies. Oricon allowed me to have him subtly influenced by the Dark Side’s presence. 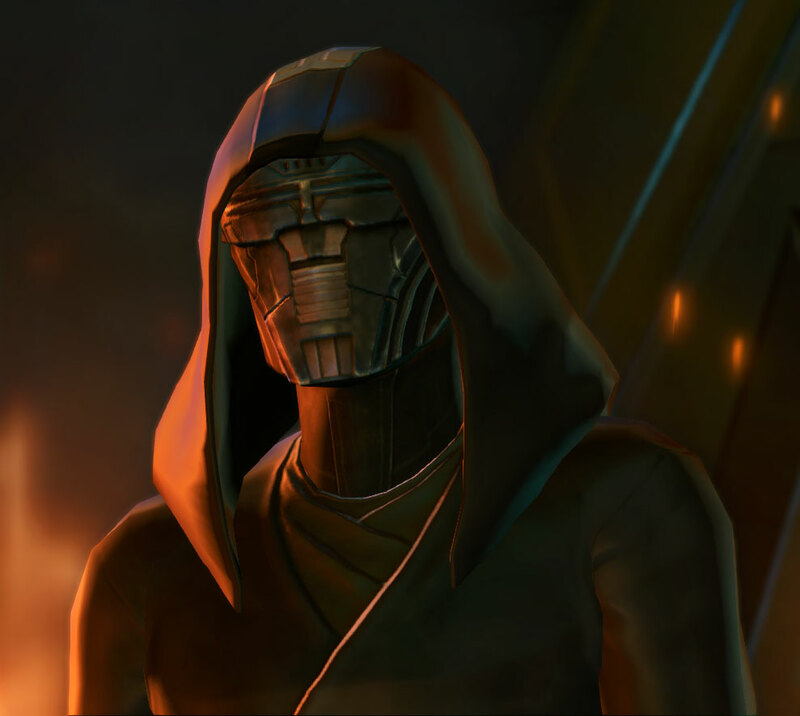 Things REALLY kicked off with the Shadow of Revan stuff, though-Lana Beniko’s influence as a rational Sith (but still Dark Side! ), along with his exposure to a similarly minded one in Darth Marr, allowed me to more easily choose some of those Dark Side choices. The final straw for the character to go full on Dark Side was being frozen in carbonite for years by the Eternal Empire. After that, I had him jump right off the slippery slope (the revelation did hit after saving the Spire on Zakuul from being melted down, so he actually managed to keep Koth in his crew). Thing is, though: all those choices were drops in the bucket. In order for him to actually BE Dark Side in the game, he has to have Dark Side points exceeding the Light Side points. And since he doesn’t have the Diplomacy crew skill, that’s a long, long, long ways away. But in my mind, he’s already gone-I mean, Anakin Skywalker didn’t have to work too hard to drop his points down the cellar (although I suppose slaughtering younglings netted a heap of DS points…). Lasken’s appearance was set fairly early. I chose to make him a Miraluka, a species that tends to see via the Force and not their eyes-mainly because they didn’t have them. I went after hooded robes early, because that worked well with his appearance. Somewhere around Chapter Two of the Consular story, though, I grabbed the Diabolist robes, which gave him a darker air-and foreshadowing his fall. Eventually, though I got really sick of the clipping of the skull through the robes, so I picked up a helmet. I went through a number of them; some would remove the hood entirely, and some worked within the robe. Eventually-around the time he went full on Dark-I started using a Dramatic Extrovert helmet, which worked better than another one I’d tried (the Eradicator’s Mask). I justified his use of it by the simple conceit that he can no longer stand to look at his own reflection in the mirror anymore. His lightsaber has varied in color; in happier times it was blue, but then it went Sithy-red. He’s using a purplish one now, though, thanks to a chance cube he got in a Command Crate. Lasken, naturally, did not kneel before Valkorion-and in the end, he chose to take the throne for himself. The story of his arrogance and hubris have led him inexorably to the conclusion that if the galaxy is to be at peace, it must be imposed-by him. In his heart, he has already decided to conquer the Republic and the Empire-because the rulers of both have proven to be hopelessly inept at the task. Perhaps he will be a benevolent despot. And perhaps not. I haven’t run him through the post-Knights of the Eternal Throne content as of yet, so he has yet to choose a side to support on Iokath-and unfortunately, there is no choice to say “a plague on both your houses”. I may flip a coin. While I wasn’t able to get Lasken down in Dark Side points as far as I’d like-or technically Dark Side at all-I’m happy with where I’ve taken his story. He’s fallen in all but game mechanics. A terrifying end to his story…for now!